The British left's task isn't to win the next general election — it's to fight for the survival of the Labour Party itself. Theresa May has called a snap election. Front pages of the right-wing tabloids are looking forward to “Blue Murder.” They exhort May to “Crush the Saboteurs” as the Daily Mail squealed, in a gleeful nod to its Blackshirt past. This is the end, they fantasize, of metropolitan leftism, of Remain voters who won’t shut up, of political correctness, and above all of Jeremy Corbyn. Unsurprisingly, many of Corbyn’s ostensible political colleagues agree, with relish. And how could they be wrong? Labour is polling at 25 percent of the vote, and the Conservatives have a twenty point lead. Allowing for all possible caveats — the unpredictability of British politics, the size and motivation of Corbyn’s base, polling bias — it is difficult to see how that will be reversed in seven weeks. And if it isn’t, Labour will be lucky to keep two hundred seats, let alone win the general election. This is all completely accurate and, by common sense assumptions, it should result in the end for Jeremy Corbyn. But no statement of political reality, however accurate, is purely descriptive. Most of the time, neoliberal politics is a self-fulfilling prophecy. We are told “there is no alternative” by the people who have the power to decide whether there is one: and so, usually, there isn’t. Likewise, statements about someone’s “electability” contain a performative element, in that they are usually trying to help create a consensus that they claim to be describing. There is a perfectly valid and viable political party that is left wing, union based, led by someone such as Corbyn and appealing to a mix of metropolitan elites, students and some trade unionists … this approach could gain the support of 15% to 20% of the public and possibly, with the infrastructure, money and backing of the big trade unions, up to 25% to 28% of the vote. By implication, such a party could survive in a proportional representation system, but could never assemble a viable parliamentary majority by itself. This wasn’t completely wrong, but it was never purely description either. Corbyn’s leadership of the Labour Party was embattled from the first day, subjected to matchless volleys of abuse and sabotage precisely intended to grind Corbyn’s Labour down to its core support. But it took just over a year of briefings, plots, resignations and a reckless, death-wish coup attempt amid the country’s most urgent political moment, to drive it out of the low thirties, and into the mid-twenties. Now, as Theresa May calls a snap election, in an effort to capitalize on Brexit before it goes sour, and prevent prosecutions of her MPs over election fraud from destroying her weak majority, there is a more or less open campaign on the anti-Corbynista Labour Right to throw the election. Not just throw the election, indeed, but maximize the carnage. Corbyn’s critics, confronted with this point, would no doubt complain that the leader and his supporters seem unwilling to take the blame for anything. Of course, this is disingenuous — it is they who are taking reckless actions without accountability. But, they are right one point: Corbyn is not powerless. He takes the lead in day-to-day policymaking, he decides priorities, and he has the pulpit when it comes to combatting the Tories on a weekly basis. That this power derives from democratic rather than bureaucratic sources is important — it means he is more vilified in the media than any other Labour leader to date, including Foot, Kinnock, and Miliband, and that his own colleagues are out to destroy him. But it also means he is hard to remove unless he caves in, or unless there is a hard coup against him — even with a dreadful election defeat. So if “blame” is beside the point, responsibility is not. A confident Corbynite left can and should assume full responsibility for the current situation. Not because it is to blame for Labour’s electoral mess. In truth, even the saboteurs only exposed the existing underlying weaknesses of Labour’s support. But because a left-wing leadership always meant a crisis leadership. The justification for taking the once-in-a-lifetime chance to have the left lead the Labour Party was never that it would be smooth sailing, but that it would be a better, more productive crisis, than slow-burning Pasokification. Labour’s establishment, having never been told what to do by a bearded leftist, was not going to take it lying down. The members who backed him knew this, and so did trade unionists and trade union leaders, and so did Jeremy Corbyn. The precise scale and timing of the attacks might be a surprise, but no one expected it to be an easy ride. And if they did, there was plenty of evidence during his initial leadership campaign, including the first attempt purge of new members, to foreshadow what was coming. 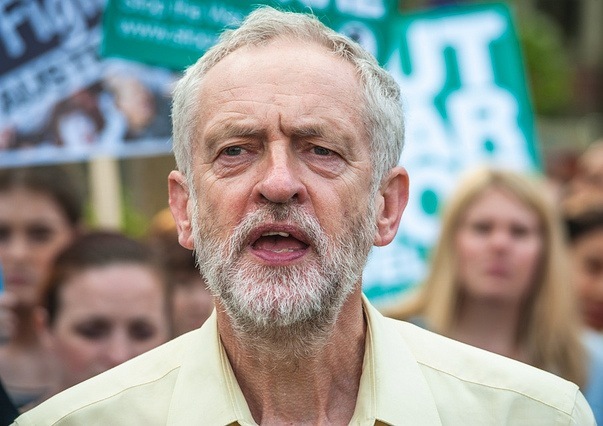 Corbyn has attempted to reckon with the overpowering forces against him by placating his rivals and softening his stance on key issues like NATO and nationalization, to no avail. Rather than propounding Bennite socialism, he steered down the historic center of Labourism. The idea was to acculturate the party’s establishment to a peaceful status quo with a left-wing leadership, and isolate the most belligerent rightists. This would buy time for an inexperienced and fragile left-wing leadership to develop an agenda, and a disorganized base to get organized. The ranks and ranks of Labour MPs joining the coup effort last year demonstrated how little effect this had. The strategy didn’t work, and it is part of why Labour is in the difficulty it is in. The leadership looks increasingly paralyzed: plenty of good policies, a lot of uneasy fudging over key issues like immigration and Brexit, and no “vision.” That doesn’t mean any other strategy would guarantee better results. But ironically, as Labour’s polls get worse, it was the neoconservative columnist Danny Finkelstein who had the best advice for Corbyn: he should assume he has nothing to lose, forget about trying to conciliate with the backbench mob, be the radical socialist that his supporters and voters want, and see how far he can get. So why doesn’t Corbyn simply go for it? There was a brief, though seemingly abortive, “populist” moment in the new year, wherein Corbyn was about to emulate at least some of the insurrectionary language of Jean-Luc Mélenchon. If he took this out on the campaign trail, addressing packed meetings, it would surely be a welcome alternative to the awkward, peace-making triangulations. It would help counter the internalized defeat, confusion, and demoralization of the British left, by creating a militant, vibrant, political counterculture in an era of reaction. The problem is that while Mélenchon is still the archetypal outsider, leading a fringe force into the mainstream, Corbyn had the extraordinary luck of winning the leadership of the official opposition, a mainstream social-democratic party. The Labour Party is not an uprising, but a traditional parliamentarist party, and no leader can deviate too far from its institutionalized commitments. Ultimately, Tony Blair was right. Labour’s factions do not belong in the same party. Their coexistence is at best awkward and debilitating for both factions, at worst produces a horrifying cycle of internal warfare instigated by an entitled and reckless party management. They are likely to be driven apart in some form or other, either by means of a right-wing split, or through an effective coup and purge of the Left. But for the time being, Corbyn is too entrenched to be shifted, and his opponents don’t dare split. So they’re stuck in a messy, violent, mutually destructive embrace. Therefore, consider the scenario after the election, assuming it to be as bad as predicted. Immediately, the Labour Right demands that Corbyn “do the decent thing” and step down. They will hope, through pressure, to achieve what they couldn’t last year, which was a neat “soft coup.” If he steps down, they reason, MPs can simply ensure that no left-wing candidate is permitted on the ballot, and thus the sovereignty of the parliamentary party over the membership is once more secured. Corbyn, unless utterly exhausted, will refuse. A major purpose of his leadership is to ensure that the party machine is subordinate and accountable to the membership. Those reforms are far from even beginning, there is not as yet a replacement in waiting with the requisite political hard-headedness and experience to see it through, and they wouldn’t get the parliamentary nominations required to stand for leader even if there was. So, Corbyn will probably force them, if they want their pound of flesh, to trigger another election in which he is a candidate. Who will the Right put up as a candidate? What, concretely, will they propose as an alternative? How will they remedy the crisis of social democracy in its British iteration? Will they dare to actually specify a policy disagreement with Corbyn, unlike last time? Even if they do, they can’t surely expect gratitude from the members for two years of constant war? It seems difficult, though not impossible, to conceive of an actual candidate of the party machine who would be able to win with the current membership. So they will have to cut their losses and come back again next year. The alternative is to go for a hard coup. This would mean finding a way to force Corbyn out through some juridical machination, even to the point of exhausting court battles and furious attrition at the base, demoralizing even allies and possibly breaking the party in “reclaiming” it. It would mean bypassing members, seen by the Labour Right as a hostile force. It would probably mean a renewed war on local branches, with suspensions and investigations for those deemed troublesome. But it would also mean a further withering of the party, restoring it to its trajectory as a light-footed, baseless electoral-professional machinery heading toward Pasokification. Neither outcome is particularly pleasant, and each will be far worse, far more pungently destructive, the worse Labour’s election results are. In effect, both would tend towards destroying the Labour Party in a furious conflagration rather than permitting some sort of amicable break-up. The immediate task of the British left, then, is not to pursue a fantasy: kick Theresa May out, bring down the Tories, get a socialist government, and so on. That, while it would be welcome, is unrealistic as a goal. It will only mobilize the true believers. The task is to fight for the survival of the Labour Party, on which all our hopes currently depend. It is to defend as many Labour seats as possible, blunt the edge of the Right’s sabotage, and thus limit their chance to do further damage after the election. The British left’s task isn’t to win the next general election — it’s to fight for the survival of the Labour Party itself.